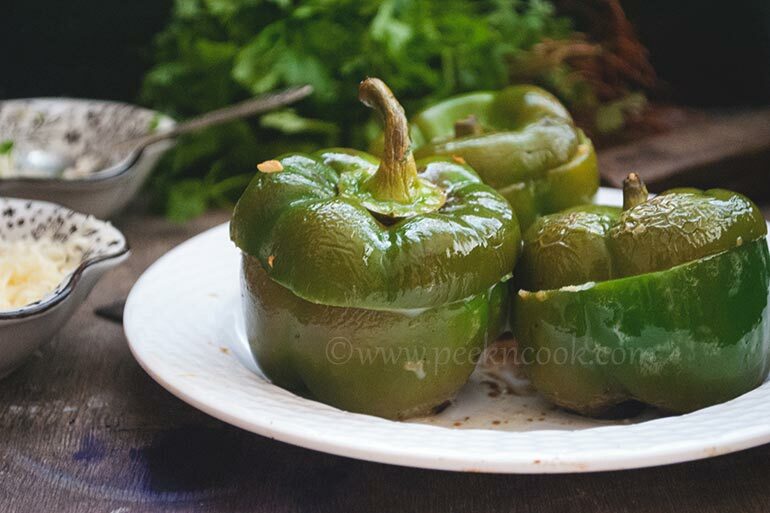 Stuffed Peppers is one of several stuffed vegetable (Bharvan subji) dishes. It consists of bell peppers stuffed with cooked flesh, potatoes, onions, seasoned with chili, turmeric, coriander, cilantro, salt and lemon juice. The peppers are then either browned in a Tava (frying pan) or baked in an oven until the peppers are soft. Slice each capsicums from the top .Scoop out seeds and keep capsicum cup and top aside. Heat oil in a pan. Stir-fry spring onions, add cilantro, paneer, salt, chaat masala, green chilies and cumin powder. Cook further for 4-5 minutes. Remove from heat. Fill the paneer mixture into the capsicum cups and cover the top with the capsicum slice. Secure with tooth-picks. Preheat oven to 150 degree C or 300F . Place stuffed capsicums on a baking tray or skewer carefully and grill on charcoal for 8-10 minutes till the skin of capsicum develops golden brown spots. Remove tooth-picks and serve hot. If you want you can use colorful bell peppers.